Facebook ads are great if you know how to perform them. Facebook comes with a complex platform that allows advertisers to create unique marketing angles and reach extremely targeted audiences. However, obtaining satisfying results won’t be easy. The rough part is that paid advertising comes with risks. You can spend all your budget on a campaign that pays off. The ROI (return on investment) of your Facebook campaigns is mostly what matters for the long-term performance of your business profitability. Once you find a campaign that generates a positive ROI on a consistent basis, you can start investing more money in order to richen your revenues. Yet, you’re reading this article because the return on investment that results from your ads isn’t satisfying for you. You want to get more out of your money, and that’s understandable as no one enjoys losing money or wasting time. 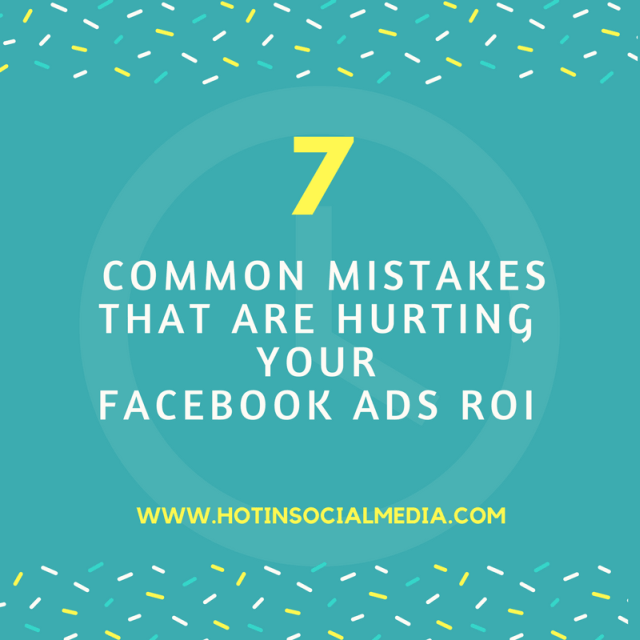 In today’s post, we’re presenting 7 common mistakes that are hurting your Facebook Ads ROI. The first mistake rookie marketers do is that they’re not focusing on one specific goal. A Facebook advertising campaign must be developed with an end purpose in mind. For example, some companies want to improve their brand’s awareness. If that goal is set, they’re obviously going to use the CPM model instead of the CPC one in order to lower the expenses. Moreover, the overall strategy of placing images and using the right hooks is heavily influenced by the goal of the campaign. Before investing any penny from your budget, make sure that you decide the main purpose of your campaign. Facebook’s ads platform offers advertisers more than one way of displaying their offers to different their target audiences. There are news feed ads, lead ads, right column ads, dynamic products ads, page likes ads, canvas ads (mobile animation), and several more options. Each of these ad types is good for specific audiences and offers. Therefore, you need to select the right ad type for the right campaign. If you fail to target your audience properly, you’ll fail to generate a positive ROI. That’s a fact because broad targeting leads to low relevancy score. That is a key factor that Facebook counts when calculating your CPC or CPM cost. If you target your potential customers well, you’re going to get a better CPC/CPM, and a better return in sales or leads. Find your “target persona” and stick to its buyer characteristics. Take advantage of the custom audience feature that Facebook recently introduced and understand how remarketing works. That’s a great way to improve your ads’ profitability. An efficient call-to-action can make the entire difference between successful and mediocre advertisements. The CTA is the element that motivates the customer to perform the action you’re requesting by appealing to his subconscious mind. When someone asks you not to click the red button, you’ll want to click the red button. If an advertiser tells you to “Click here”, the same effect will happen, and you’re likely to go with the request. Pay attention to your CTAs, as they are a significant factor that decides your Facebook campaign’s profitability. Ads are all about drawing attention towards certain elements. Make your ads worthy of notice, and you’ll have winning campaigns for a long time. Now – in order to spark the curiosity of the viewer, you have to use high-quality images that are also eye-catchy. Take advantage of out-of-the-box headlines that come with interesting beginnings of stories, important news, or warnings that spark fear. You’ll never develop a long-term profitable Facebook campaign without testing more campaigns. Some of these campaigns that you’ll test will be winners, and again, some will be losers. You’ll win money and you’ll lose money. However, this iteration process is absolutely essential to your long-term success with your Facebook’s campaigns. If you don’t test enough campaigns, you’ll never be able to figure out which alternative is worth pursuing the most. Every business organization, whether it is an offline or an online one, has to offer a unique value proposition. This is what makes them different from the competition, and this unique value that they bring should be emphasized the most. So, in case you’re not showing anything better than the ordinary, you can’t expect to have a high ROI. Facebook advertising might be hard to figure at first. You’ll come across a lot of challenges and problems that you must overcome. Don’t give up until you find your success. Sometimes people give up just a few moments before success knocks at their door. Take into consideration our tips and notice how your campaign’s ROI improve. Julie Petersen is a freelance writer and the founder of essay writing service reviews blog. Follow Julie on Twitter.